Swallow me Whole is scary. But in a completely different manner from Coraline (see below). And it deals with a whole other set of problems than gothic Coraline does. 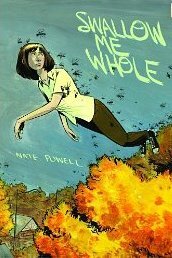 Swallow me Whole has characters, Ruth and Perrym who are some years older than Coraline. They are in highschool and they are stepsiblings. And something is wrong with both of them. They are sick. Perhaps suffering from schizophrenia. One of the key words for this novel is actually “Schizophrenia”, but this is never mentioned in the story itself. Actually, a lot of things is left unmentioned, even though we are also dealing with parents who are ordinary and doesn’t seem at all to be having hidden agendas or strange behaviour. Another key word is “Family Drama”, and since the parents seem fine and not prone to any form of drama, this key word must relate to the terrible drama of having two kids who are both very, very sick. As parents you may not think much about it at first, but my gosh, Ruth and Perry are weird. Ruth collects insects and Perry has a pencil which can transform itself into a magician. Now, I know there is nothing especially weird by collecting stuff – I collect books, and I am not schitzophrene. And the reader doesn’t REALLY know how much of this goes on inside the heads of Ruth and Perry and how much is actually true. Of course the pencil-magician must be inside Perry’s head, but about the insects…I don’t know. Maybe most of the jars in which Ruth keeps those insects are mostly in her head? One thing is for certain though: the stepsiblings talk to each other about the insects and the magician (long time since I met such a nasty character as this magician), and they never doubt each other’s stories. As time goes by, psychiatrists and medication come into the kid’s lives, and the reader tries and tries to get into this strange, horrible and sick life those young people live. The parents worry. But maybe not enough? Almost everything that can go wrong, goes wrong for Ruth and Perry, and this is a scary, scary story in all it’s simple style. It is not funny or comic in any way. The drawings are strong in their black and while smudgy style. Sometimes the text is so small that it is alsmost impossible to read. This is not a mistake, but surely made like this on purpose from the writer’s side. The ending is not left open, although it does leave room for a bit of guessing. It is not a happy ending no matter what. This was tough reading.